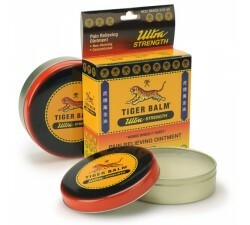 White tiger balm is less powerful than the red tiger balm. 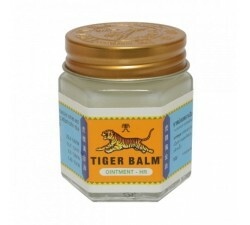 This balm can relieve your aches muscles slowly. This balm gives a cool sensation. 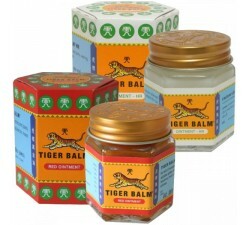 You can use this balm for : migraines, mosquitoes sting, running nose, itchiness, obstructed airway. 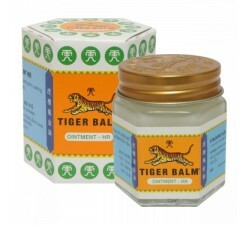 The tiger balm white clears the respiratory tract, stimulates blood circulation and energy at the same time it provides a gentle sensation of freshness and relaxation. Ideal for relieving headaches it is easy to apply. In this case we will apply for example the temples and massage slowly and without pressure in a circular fashion. A gentle massage for complete penetration into the painful area of the skin to get quick relief from headache and migraine. Applying tiger balm white into the nose and on the chest, will clear the nose blockades & respiratory tract and running nose. For insect bites, apply and press it with your fingernail on the insect bite area of your skin and it will get cured quickly. It is a simple and effective product for these types of bite allergies. - Place a hazelnut in the palm of your hand and apply on the sore area. - Apply to the chest to clear blocked airways. - Massage until completely absorbed balm. - For headaches, use it rubbed on the temples. - Repeat the process if necessary.